ST. JOHN'S, N.L. - As Premier Kathy Dunderdale announced her resignation Wednesday there was a moment when her voice caught and she fought tears. "Public service always, always means great sacrifices for families and so it has been for mine," she said, glancing at her daughter Sara. "But my family has been absolutely extraordinary. I could not have served otherwise." Dunderdale, who has been under growing pressure, announced she will quit Friday as premier of Newfoundland and Labrador and leader of the Progressive Conservative party. The defection Monday of a once loyal supporter cut short a family vacation and spurred what party insiders have called her inevitable exit. It's an early end to a landmark victory on Oct. 11, 2011, when the province's first female premier — the daughter of a Burin Peninsula fisherman and one of 11 children — won a majority government. Her Tories took 37 of 48 seats and Dunderdale spoke at the time of wanting not one, but two four-year terms in the top job she inherited when Danny Williams quit politics in December 2010. "One of the greatest challenges is going to be that I'm not Danny Williams," she said of the stark void left by one of the most popular premiers this country has ever seen. Those words would haunt Dunderdale. Just over three years since she became the uncontested Tory leader, political observers say it will be a steep climb back to contention for her party before the next election. "Ancient Hebrew scriptures teach us that there's a time for everything and a season for every activity under the heavens," Dunderdale said as she announced her departure. "Just as you know when it's time to step up, you also know when it is time to step back, and that time for me is now." Dunderdale, 61, spoke in the lobby of the province's legislature, surrounded by caucus members who applauded and embraced her. While the backing of her innermost circle appeared to be holding, the surprise move Monday of backbencher Paul Lane to join the Opposition Liberals was another jolt to her hold on power. Lane had been one of Dunderdale's most vocal supporters but said she has lost touch with voters. He cited constituents' unease with tightened restrictions on access to government information, and said she badly handled a series of major electricity failures earlier this month that at one point left 190,000 customers cold and fuming. Lane's decision to cross the floor followed Tom Osborne's departure from the Tory caucus more than a year ago. The former cabinet minister initially sat as an Independent before joining the Liberals. Overarching Dunderdale's recent troubles has been her inability to publicly translate what supporters say is her private warmth. A tendency to come across as lecturing or dismissive hit its height in the midst of the blackouts as she outraged many residents by refusing to call the situation a crisis. It didn't help that Dunderdale had one tough act to follow, said Kelly Blidook, a political scientist at Memorial University of Newfoundland. "Danny Williams was one of those premiers who was just loved and extremely popular," he said in an interview. "It would be difficult for anybody in that same situation and, in her case, she was just seen as not really connecting in the same way." 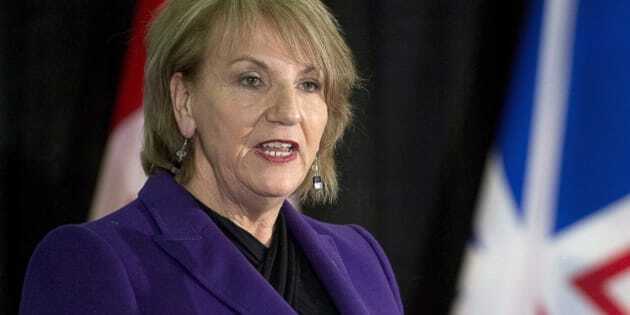 Still, Dunderdale said she fought for smaller class sizes, a stronger economy and the $7.7-billion Muskrat Falls hydroelectric project now under construction in Labrador. Finance Minister Tom Marshall, who has said he will not seek re-election, will be interim premier. Marshall said Dunderdale told him she will remain as a member of the legislature for a while but will then "move on." "This was her decision. This wasn't a caucus decision," Marshall said. "She left as she served: with dignity and with grace." Marshall said the details of a leadership race and a possible election are to be worked out. But he said he only expects to be at the helm for three or four months before a leadership convention is held. Under provincial law, Dunderdale's resignation triggers an election within a year of the new full-time party leader taking office as premier — spring of 2015 under the timetable Marshall suggested. A fixed-date vote had been set for October 2015. Dunderdale was first elected in October 2003 in the St. John's-area district of Virginia Waters as the Tories swept to their first of three successive wins. "As the first woman to serve as premier, I hope I have stoked the fires of imagination in young girls in our province, and inspired them to consider running for public office," she said Wednesday before taking her daughter's hand and leaving without taking questions. "Tell them from me that there is no greater reward than knowing your service has made a difference to others."